The other day, I had a serious craving for a cookie. But, the weather has been so hot lately, there was no way I was about to turn on my oven to bake a batch of cookies. The other day, I had a serious craving for a cookie. But the weather has been so hot lately, there was no way I was about to turn on my oven to bake a batch of cookies. Instead of giving up on my craving altogether, I decided to challenge myself to make a delicious cookie from whole ingredients without turning on the oven. 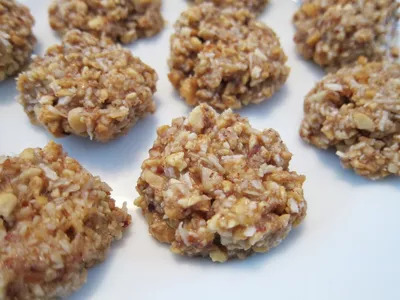 The end result was a sweet and nutty, no-bake cookie made from mixed nuts, coconut oil, shredded coconut, almond butter, honey, and sea salt. They turned out great! If you're looking for a cool, summer treat that requires minimal effort and no baking, here's the cookie for you! Place nuts in a food processor (or blender) and process until coarsely chopped. Melt coconut oil in a saucepan on the stove top. Once coconut oil is fully melted, add nuts, honey, almond butter, shredded coconut, salt, and vanilla extract and mix well. 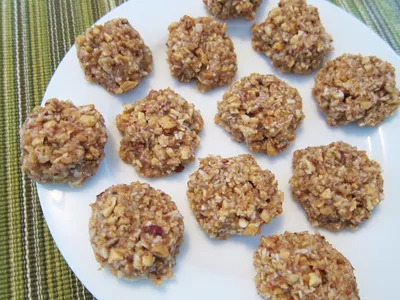 Allow nut mixture to cool for a few minutes and then use a tablespoon to portion it onto wax paper. Flatten balls with the palm of your hand. Allow cookies to chill in the refrigerator for at least 60 minutes before serving.